If it’s your turn to entertain this Christmas, make sure your home is as welcoming as can be. In the latest blog post by Williams Windows DG Limited, we discuss how you can make your living room extra cosy this festive season. Coming in from the cold to a nice warm home is a delight that can only be felt during the cold winter months. However, if your home is draughty, the greeting is much less inviting. You may have your heating up full blast, but if your windows are letting in cold air, not only will you be wasting a lot of energy and money, your house will never feel fully heated. Consider investing in new windows and doors to shut out cold air and bring your heating bills down. The investment will also go a long way in sprucing up the aesthetic appeal of your home. How do you decorate your window? Adding additions such as curtains, nets or blinds to your windows provides an extra layer of protection from the outside elements. Opt for thick, fully lined curtains to provide a cosy feel. Nothing says cosy like blankets and candlelight. The little details in a room can make all the difference, so when searching for cosy living room ideas, don’t overlook these key features. For the ultimate in cosy appeal, consider investing in blankets that your guests can use when they come inside from a Christmas walk. 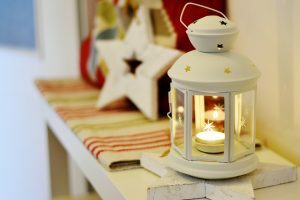 In the evening, use fairy lights and candlelight (real or battery operated) instead of main lights, this will create a warm glow, rather than the stark wash of colour often gained from the main ceiling light. For extra appeal, introduce scented candles or reed diffusers in traditional festive fragrances, including, cinnamon and gingerbread. We hope you’ve found these cosy living room ideas helpful. If you would like more information regarding our wide range of services, including bespoke conservatories, windows and doors, we welcome you to get in touch. Please call 0208 428 5433 or use our online contact form. Have a merry Christmas from Williams Windows DG Limited.